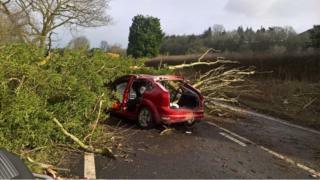 Two men have been injured when a tree fell on their car as high winds hit Shropshire. The car was travelling along the A49 in Church Stretton at about 09:30 GMT when the tree toppled onto the bonnet of the car and the rest of the road. An 80-year-old man, a front seat passenger, was taken to hospital with a cut to his neck and chest pains. His wife, sat in the back, was unhurt. The 75-year-old driver was also taken to hospital with neck and chest pains. More than 4,000 homes are currently without power in Shropshire and the high winds have also grounded the Midlands Air Ambulance.